MONTEGO BAY, Jamaica, CMC – Head coach Graeme West believes the West Indies A-team programme performs the vital dual role of feeding players into the international side and also strengthening regional franchises by helping players enhance their skills. The Englishman, who has overseen the programme of recent, said the various tours had ensured that regional players developed their ability in differing conditions, experience that could be then utilised both at the domestic and international levels. “They are invaluable to the players. It allows them to play against different methods,” West said ahead of today’s start of the opening four-day “Test” between West Indies A and Sri Lanka A at the Trelawny Multi-Purpose Stadium. “This is a home series but when you travel and play in different conditions, it adds to a player’s methods, it adds to his experience and the beauty of having them back on the calendar, I feel that the players coming through the programme will be better prepared to move forward to the next level. 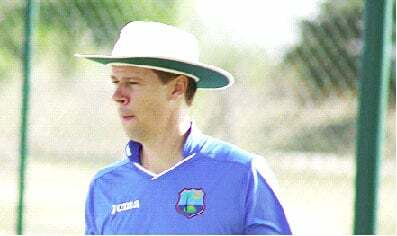 West Indies A coach, Graeme West. West Indies A clash with the Sri Lankans in a three-match “Test” series before also meeting in three one-dayers, in a tour running from today to November 5. The series is the second between the two sides over the last 12 months, following Windies A’s tour of Asia last year October. In preparation for the rubber, Windies underwent a training camp in Antigua, one which West said had been valuable for his side. “I am very pleased with the work that the players have put in. The work in Antigua we did was good,” West explained. “Several of the players did not have a great opportunity to practice, due to the hurricanes in the Caribbean, but I feel everyone has got up to speed very quickly, and the two sessions we have had in Trelawny have been excellent. The series will see second “Test” bowling off at the same venue from October 119-22, with the final match – day/night contest – scheduled for Sabina Park in Kingston starting October 26.